We started out at the cathedral (Where we noted the temperature had suddenly become ‘very seasonal’. It was great to get moving and warm ourselves up a little! We then moved to the memorial by the market (We could smell the coffee)! After a short break we moved to Market Street. Despite the bitter wind we had a great time entertaining. Here is a snippet from the day. We don’t get more local than this! We are looking forward to dancing again at the Sutton beer festival. This time we will be dancing on the evening of Thursday 9th August from around 7.30pm. The beer festival is at St Andrew’s Church and is on From 9th – 11th August. We hope to see you there! These are the awesome members of Sutton Masque that braved the terrors of far flung parts to travel to Rattlesden in furthest Suffolk and dance at The Five Bells. 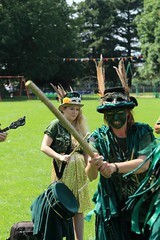 This was in aid of a charity fund raiser for The St Elizabeth Hospice. We will be out and about this fine bank holiday weekend in two locations! Saturday 26th May at Rattlesden 5 Bells (Suffolk), fundraising event for Elizabeth Hospice from 2pm onwards. On Sunday 27th and Monday 28th May we will be at The Festival of Country Life, Lamport Hall. Between 11am and 4pm each day. This Wednesday we will be at The Bank Willingham from 7.30pm. Pop along for a cold beer and a warm welcome! I recently found this footage of Sutton Masque at September 2017 Sowerby Bridge Rushbearing Festival. 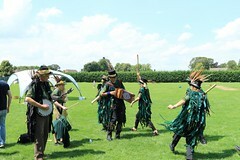 We were dancing ‘Just as the tide was flowing’ (A Witchmen Morris side original). As fabulous as this is as a dance (Please enjoy), there is some additional entertainment… just listen to the background chatter from the ladies in the audience! 🙂 (Video posted to U tube by Ian Brooke). 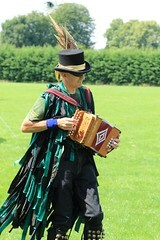 It was with some trepidation about the 4th Halesworth Day of Dance that I went to bed on Friday night. The forecast was for snow overnight with more possibly to come. That’s not so bad, I have danced before with snow lying on the ground. However the 20mph winds gusting to 40mph were a bit concerning. That was not going to be pleasant, not at all. Would there be anyone that would stop to watch even if we were foolhardy enough to actually attempt to dance? So it was a big relief on the Saturday morning when the email arrived with details of an indoor venue. As we walked through Halesworth we reflected on what a nice place it was and that it was a shame we would not be gracing the various spots around with our dancing but the weather made it abundantly clear that our tactical retreat had been the correct decision. The hall was hot and crowded but the dancing was somehow the better for it. With so many sides in once place it took a while for us all to get even one dance in but it was great to get to see so many other sides perform. We retired to the White Swan for a midday ‘refreshment’ break which was very much appreciated. They had a BBQ organised for the Day of Dance so food was gratefully eaten and washed down by a drop or two of some excellent beers. Then it was back to the hall for more dancing. Our turns came around more quickly now that other sides were taking their turn for a lunch break. All that was left after that was to return to the pub and get ready for the Ceilidh in the evening. I mean what else do you do after a Day of Dance, but more dancing of course? This was our first visit to Halesworth for the Day of Dance organised by Ox Blood Molly, but we are already talking about coming back next year. But maybe whoever books the weather will make a better job of it?